The Four-Year-Old has been asking questions much more quickly than I can research and answer them. At the moment, my pending questions queue has some 115 questions in it. So in an effort to tame the beast a bit, I’m going to break with my one primary question per Caterpickle routine and deal with several unrelated questions at once. Because she wasn’t born with the glow-in-the-dark jellyfish gene. Because the rocks that make up Iceland aren’t old enough. The oldest rocks in Iceland date back to the Miocene epoch (5.3 million – 23 million years ago), a good 40 million years after dinosaurs had disappeared from Earth. As a bonus, the rocks in Iceland are generally the wrong type. Most are igneous rocks formed by volcanic eruptions. Only 10-15% of them are sedimentary rocks–the kind that can contain fossils. 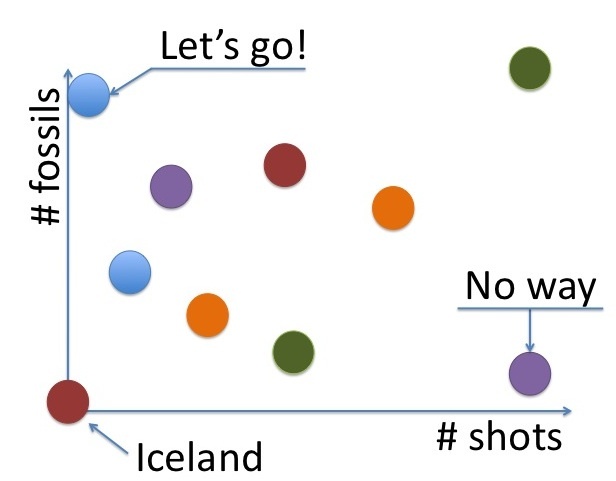 For those of you keeping track, this means that Iceland fails The Four-Year-Old’s Dinosaur Fossil ROI Per Shot Received calculation (see Figure 1). Guess we won’t be going there this year. According to Wikipedia, Rudolph the Red-Nosed Reindeer first appeared in a 1939 story written by Robert L. May. Which means Rudolph will be 72 when he pulls Santa’s sleigh this year. Whew! Only 109 questions left to go. So when did Olive first appear? Oh what a fabulous question! Naturally I thought at first you were talking about Rudolph’s little girlfriend in the Christmas special I watched as a kid. But no, her name turns out to be Clarice. But of course, as my librarian kindly informed me when I asked her for help this morning, you’re talking about Olive, The Other Reindeer, who first appeared in book form in 1997 in the story by Vivian Walsh , and whose story was later adapted for TV (first airing on Fox in 1999). Then I guess you are never going to need readers to send in questions… like “how do you trim a cactus?” it turns out, you can trim a cactus (leading to a whole day of having to hear ” mommy you are wrong”) and there are some specific tools that you can purchase for this task. my personal favorite – the cactus whacker tool pack. Actually, I love reader questions. Thanks to them I’ve learned that fossils are only considered fossils if they are at least 10,000 years old and all about Olive the other Reindeer. So send in the questions from your boys. I know they’ve got lots. Well, one of them might.